Ajay Pancholi from Bharuch, B.Sc Graduate. Working for : DIC FINE CHEMICALS PVT. LTD. Currently working as HEAD - EHS at DIC FINE CHEMICALS PVT. LTD.
SAFETY HEALTH & ENV.. SAFETY & REGULATORY .. HAZOP & RISK ANALYSI.. ENVIRONMENT & STATUT.. SAFETY TRAINING&SAFE.. SAFETY AUDIT ENVIRONMENT CLEARANC.. ENVIRONMENT COMPLIAN..
are one of expert skill area's of Ajay Pancholi . 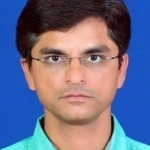 Ajay Pancholi is working in Production/Manufacturing/Maintenance industry.